Home » Products & Services » What We Know About Fish » Why buy frozen? 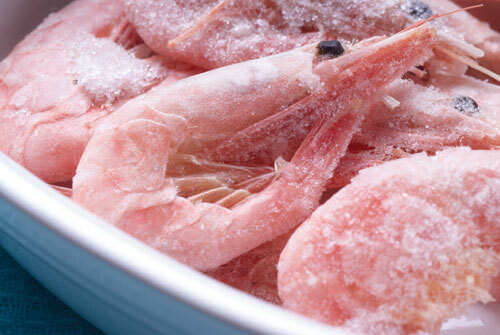 Frozen-at-sea fish and prawns are caught at their peak of quality and frozen within 4 hours giving the freshest and tastiest seafood! Frozen within 4 hours of catch. Frozen within 4 hours of harvest. Fresh fish which is caught and sold to a frozen packer will be frozen within a day of arriving with the processor, thereby ensuring it is frozen at fresh market quality. Boat caught and landed at market. Sold at market and transported to processor on the same day. Processed and frozen within 8 hours giving optimum quality. This is the freshest fish but volume is very low and you need to live near a local harbour to buy. Boat caught, normally from a day boat. Sold fresh to consumer within 2 days of catch. This is perceived as being fresh fish but it can spend a long time within the food chain before it is sold fresh to a consumer, especially with modern chill techniques. Boat caught allowing sailing to fishing grounds of 3 days, fishing for 3-7 days and 3 days sailing to return to port. Fish can be 10 days old by the time it reaches harbour. Sold at market, processed and distributed through normal distribution chain to customer (normally 4 days). Sold fresh to consumer up to 14 days (2 weeks old) from catch, but can be longer depending on packaging and shelf life. Chilled fish is often frozen fish which has been defrosted and is then distributed through the chilled food chain. Follows same supply chain as fresh and frozen fish. Predominately frozen fish sold on the defrost. See our range of frozen fish.